Eight hundred Virginia troops are quartered in the vicinity of JOHN BROWN'S late abode in Washington County. It is said that they have fortified the heights opposite Harper's Ferry, and have set the mountain on fire, and burnt the undergrowth and leaves and other obstructions to an extensive view of the surrounding country. 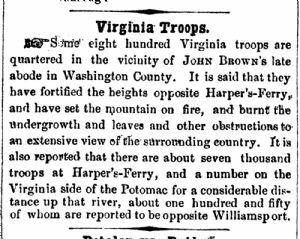 It is also reported that there are about seven thousand troops at Harper's Ferry, and a number on the Virginia side of the Potomac for a considerable distance up that river, about one hundred and fifty of whom are reported to be opposite Williamsport.